Worse, Sicarius, the empire's most notorious assassin, is in town. He's tied in with the chaos somehow, but Amaranthe would be a fool to cross his path. Unfortunately, her superiors order her to hunt him down. Either they have an unprecedented belief in her skills...or someone wants her dead. First and most importantly... The Emperor's Edge ebook edition is FREE at Amazon, Barnes & Noble, iTunes, Smashwords, and Kobo. I have the Kindle version. Just the other day I purchased the audible narration to go with the ebook and it was a $1.99 add-on. The audible narration for later books is much more expensive. I also found a free audiobook podcast of the first three books in this series. Go to my book series list here to find links to the free podcasts. I first read The Emperor's Edge in February 2014. It kicked off my love for Lindsay Buroker's stories. I wrote a brief review on Goodreads back then. I'll give you that here really quick and then add onto it. 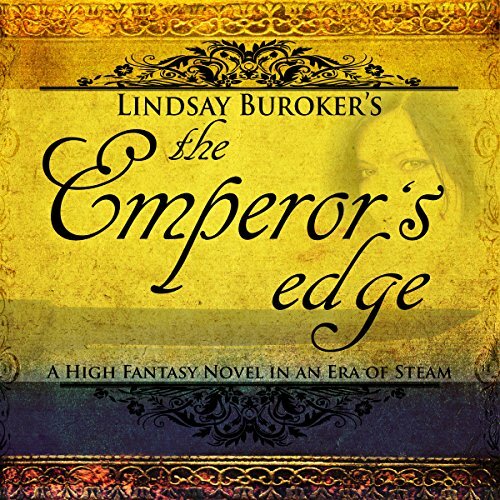 The Emperor's Edge is an unexpectedly enjoyable read. 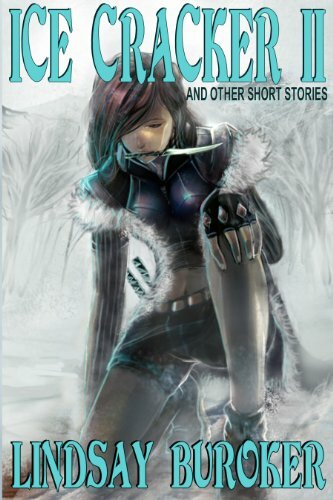 This is one of many books that I grabbed as a free ebook. It is rare that I find one that I truly enjoy. I just randomly selected this book to read not even knowing what it was about and I am glad that I did. Interesting characters, plot, engaging storyline, great writing. The book kept me interested from beginning to end! So interested that I purchased and downloaded book 2 before I even finished it and I am going to begin reading Dark Currents right away. The Emperor's Edge is a blast. From start to finish it is adventure after adventure after adventure. Set back after set back after set back (each of which is conquered in mystifying ways). There isn't much that is realistic about the scrapes that they get out of, but what good fantasy is realistic? I am impressed with the audiobook. Starla Huchton is very talented. She kept the story moving and had a believable and entertaining way of representing the individual charisma, dynamism and temperaments of the characters. This is purely personal... no matter how great an audiobook is I don't feel that they can match the reading experience. Audiobooks are a wonderful option but I prefer my own imaginations understanding of an author's characterizations. And my mind goes hog-wild imagining these characters. They are colorful, varied, and often humorous. They can also get all tumbled together when you have read through the rather lengthy list of books in The Emperor's Edge world (see the list below). So in order to help you and I both, I have created a list of the characters in The Emperor's Edge series. I hope to add additional characters over time. Please click here for the character list. I can't help myself... I've fallen for Maldonado. He instantly stood out as my favorite character. I guess that I'm a sucker for his charm. One more thing.... I had the hardest time trying to find the chronological order for all of Lindsay Buroker's series. I couldn't find a list all in one place. The lists below show the entire series of books in The Emperor's Edge world. I have also created a comprehensive list of all of her books and short stories in one place here. At the bottom of the list you will find the date that it was last updated. Buroker writes like rabbits reproduce and so it's challenging to keep up with her ;). Set in the same world as The Emperor's Edge, approximately 18-years earlier. The Sword & Salt series is set in the same world as The Emperor's Edge and follows after the events in that series. It features mostly new characters and takes place across the ocean, in Nuria. These tales stand alone as individual stories and as prequels for the Chains of Honor series. You can purchase them individually or they are sold as a collection titled Chains of Honor: the Prequels (see below). The Chains of Honor series is set in the same world as The Emperor's Edge and follows after the events in that series. It features mostly new characters and takes place across the ocean, in Nuria. The collection Chains of Honor: the Prequels is a compilation of the entire Swords & Salt tales.